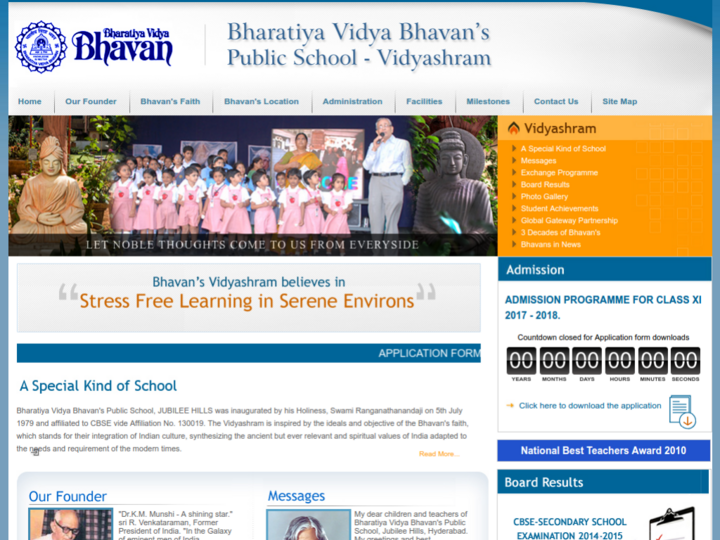 Bharatiya Vidya Bhavan's Public School, JUBILEE HILLS was inaugurated by his Holiness, Swami Ranganathanandaji on 5th July 1979 and affiliated to CBSE vide Affiliation No. 130019. The Vidyashram is inspired by the ideals and objective of the Bhavan's faith, which stands for their integration of Indian culture, synthesizing the ancient but ever relevant and spiritual values of India adapted to the needs and requirement of the modern times.